Working at home with your own children as a family daycare provider offers many rewards and challenges. Having a positive attitude and operating a home daycare in a business-like manner plays a major role in the success you may or may not experience. Your attitude can greatly affect how you act or react to the challenges you may encounter while caring for other children in your home. Simply talking to your children or daycare children and being creative in how you handle certain behaviors or situations, allows you the opportunity to deal with those instances as they occur. Quite often, you can turn an unpleasant situation into something that is laughable or at least manageable. It is imperative that your children feel special and loved. They need to know that even though they share you with other children during “Daycare hours” you love them and are available when they need you. One great tip is to signal to your children when mom’s in “work mode” by wearing a special apron, visor, hat, or other clothing item with the name of your daycare & a cute logo. When you put your apron or visor on, it means the work day has started. Parents will also take you more seriously, and your kids will know it’s time to follow the daycare rules. Following a daily schedule and being organized should allow the time needed to complete the necessary tasks of maintaining a home and running a business, while making quality time for your own children. Enforcing strict hours of operation for daycare parents should reduce the number of early and late arrivals, which can greatly impact your family life and your children’s behavior. It’s also important when you spend so much time at home, as a mother, provider and wife to make time for you as a person. Make a point to get out of the house every other night, if not every night. Go for a walk, go to the mall, the library, take a class, do whatever it takes to get away from the house on a regular basis and focus on you. Scheduling ample “time off” not only for yourself but for your family to attend school functions, vacations and doctor appointments is also an essential element of providing home daycare. This allows you time to refresh yourself and spend more quality time with your family. I received the Daycare Provider’s Workbook as a gift and I love it! 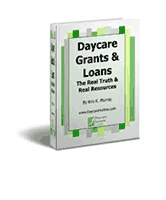 I have been a Daycare Provider for 9 years and found it to be an excellent resource. My goal this year is get organized, so I am purchasing your other products as well. Your advice is very helpful, thank you. I didn’t know what to do but now you have given me a few ideas. I found ordering on your website to be very easy. I have already received my order confirmations. Thank you for your help. You have answers. Wow! I can’t believe all the information that is contained in the Daycare Starter Kit. I received twice as much information than I expected!! What a wonderful package you have put together. Thanks for all the great information!!!!!! I am TOTALLY impressed by your thoroughness on your material. I was just reading your Daycare Ebook and I must say…You Go Girl!!! I will sit down with it tonight and read it from cover to cover. I think you have a winner here! I really appreciate your help and website. I haven’t found ANY type of site on ANY topic or activity that offers as much help and information. You are great! I have been searching for information on starting a day care. Your website and products are just what I needed. Thank you for providing this service! By far your product is the most reasonably priced and most informative. Thanks again. I truly admire you for standing up and giving children the best care they deserve. I JUST WANTED TO DROP YOU A NOTE AND TELL YOU HOW MUCH I ENJOY YOUR WEBSITE AS A HOME DAYCARE PROVIDER I AM ALWAYS LOOKING FOR SOLUTIONS FOR ANY NUMBER OF THINGS THAT CAN POP UP WHILE WATCHING CHILDREN. KEEP UP THE GOOD WORK. Just a note to say thank you. 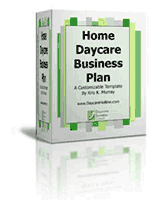 I will absolutely refer your website and products to anyone I hear of, that is planning on starting a day care. The information you provide is excellent and extremely thorough. You certainly know your stuff. Thank you so much for your informative website! This has helped me to organize my thoughts and plans for a day care at my home. 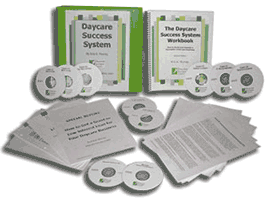 I only ordered the Workbook, but I will be placing another order for the Starter Kit. I just wanted you to know how much I have enjoyed the Starter Kit I ordered from you and how helpful it has been this far. I recently attend the Pediatric CPR/First Aid and the Health & Safety course required by the state of Calif. to get licensed…while there I showed some of the other “beginners” as well as the instructor (who teaches in a preschool) the book….they were very impressed ….thanks again for the jump start. What a beautiful book and well put together. I will be recommending your Daycare Starter Kit, to all of my members. I want you to know I appreciate your help and enjoyed the Daycare Starter Kit, it has saved me a lot of time. Thank you so much for this program!!! 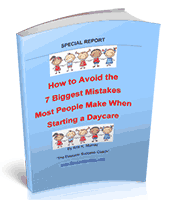 Your website is very informative for parents and for day care providers. I found a lot of information while browsing your website. Thank you for the information, keep up the good work. Thanks for all your great support. Thanks again, your info is really great, I am really enjoying it!!!!! Hello, it was an honor to visit your website, it’s fantastic! Thank you so much for inspiring me. Thank you for helping me get organized. I never would have thought to manage my business this way. I recently received my Daycare starter Kit. It has proven to be a wealth of knowledge. I have also referred your web site and products to a friend who lives in another city and is wanting to pursue the same career, I ‘m sure she will be as pleased as I have been with the quality service and information provided. Thank You! I heard about your website from a Message Board. Several providers had ordered your products and said they were wonderful. I can’t wait to get my Kit! I just received the Daycare Organizer, Forms and Recordkeeping package. IT’S A GREAT SYSTEM. Now I want the Workbook too! I just sat and read your day care provider’s workbook. I am very impressed. You did not leave anything out. You went far beyond the expectations of information anyone would need to get started. Way to go!!! GOOD MORNING, THANK YOU FOR THE DAYCARE PACKAGE YOU SENT ME. I LOVE IT!!! YOUR PACKAGE WAS SO INFORMATIVE AND MOTIVATING. I CAN’T WAIT TO START UP MY DAYCARE !!! I LOVE THE WAY YOU RUN YOUR DAYCARE. YOU HAVE REALLY HELPED ME AND AGAIN THANKS SO MUCH. I love the information. Thanks! I just want to thank you for all your help and information. You have been a good avenue of information. Again, thank you. Thank you very much. I appreciate your quick responses your company has been wonderful. I was given the lead to this website from a parent that was looking for childcare. I was then able to turn her on to other providers. Congrats on what your doing and great website set-up. I will tell others. Thank you for your time, your great ideas and your dedication! I look forward to telling everyone I know about your product and services. You take care and I will be doing business with you again in the near future. HELLO! Thank You very much…Everything looks great! I am so happy that you received the check as soon as you have and posted my web page rather quickly! Business has been at an all time low and I need all the promotion I can get! Thanks Again! Hello. I purchased your organizer a while back and I just love it!!!!!!! Thank you for all the info!!!!!!!!!!!! Just love it!!!!!!!! Hi, I ordered one of your books and loved it. Thank You! 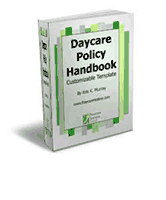 Hello, I just received your Day Care Provider’s Workbook (from Amazon.com) and first of all want to thank you for a great resource! Thank you! My webpage is beautiful just the way you’ve done it Excellent. Hip, Hip, Hooray !! 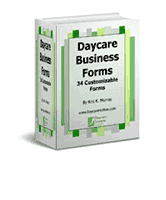 It is my honor to do my Daycare ment with your company Much Good Fortune to You. If I can donate to the website in any way please let me know. Your starter kit has been a godsend for me. Again, thank you SO much for making these wonderful tools of the trade available to us “stay at home moms” wanting to delve into the world of home day care!!!!!! The kit that you’ve put together is awesome! I would have never thought of some of this stuff. I just received your day care starter kit and I’m so impressed. I just wanted to thank you from the bottom of my heart for helping me get started with a day care. I feel so much more confident with your help and all your forms!! !